Do you like the new Timeline Facebook? Now you can have it as a theme on your wordpress. 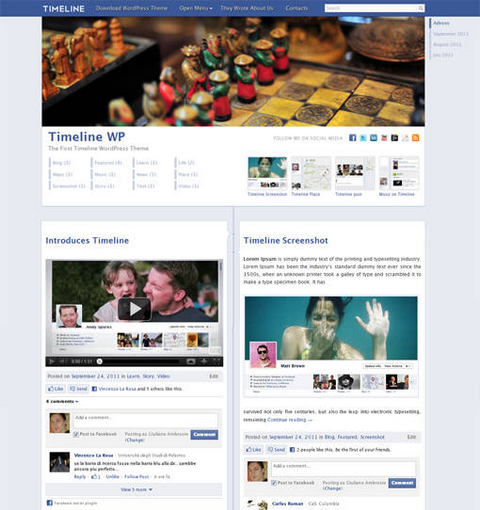 Timeline WordPress Theme was designed by JuliusDesign inspired by Timeline Facebook. The theme was developed in about 10 hours only, but it looks more than amazing. Among the most interesting features integrated into the theme, you can find the top right of the timeline by months of publishing articles. You can also enter 4 items to be placed in the upper right header always present on every page. The theme looks almost identical to Timeline Facebook, and available download for free.